We asked the designers at Indianapolis flooring store Kermans to tell us what trends they are seeing in carpet selection. Their response: color! Lots of bold color. If you're looking for new carpet, you might want to consider jumping on this trend. It's a fun and affordable way to update the design of a room. As one of the most cost-effect flooring options available, carpet is one of the best ways to incorporate a new design trend in your home. 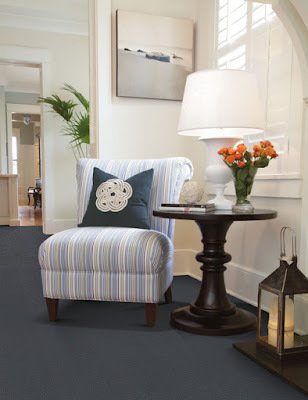 Carpet is soft underfoot and can help quiet a room. It is an excellent value for your dollar. Carpet comes in a wide variety of colors and styles. You can install carpet almost anywhere, even outdoors. Carpet is easy to care for. Want to know more about carpet? Check out our free carpet buyer's guide. Carpet comes in so many styles and colors that it can be hard to choose. Here are a few colors that are currently very poplar and work well with a variety of design styles. Everything from deep indigo to dark navy to sky blue. Darker shades of blue can anchor a room, making a large space feel smaller or adding just the right backdrop to light colored furniture. Lighter shades of blue can open up a room with an airy feel. Mossy greens and olive greens are the trend of the moment. These shades of green can warm up a room and have the added benefit of acting as a neutral. If you need that neutral influence but want to stay away from beige or cream, a warm olive green can be just what you're looking for. Greys are becoming more and more popular and for good reason. They are a beautiful warm alternative to neutral browns. Grey floors look particularly nice in a modern, contemporary design and can work in any shade from pale, light grey woods to deep charcoal carpets. Yes, purple. Shades in the blush or berry family are becoming more and more popular. Brighter shades of purple make a bold design statement while the lighter shades become a subtle accent to your design. Whether you want to take advantage of one of these colorful trends or not, we encourage you to play with your color options. Today's carpet styles, patterns and textures open up a lot of fun choices when it comes to carpeting your home. Not sure where to start? Our free design experts are here to help. Schedule a design consultation, give us a hint of what you're considering, and we'll have a time reserved for you with some initial choices laid out and waiting.